Now using our Lemon Incense Sticks you can enjoy the smell of lemon in a just another way, in a truly sensuous yet divinely manner. 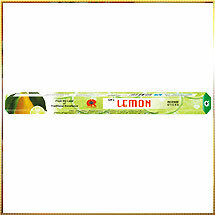 We present you a range of Lemon Incense Sticks made from lemon. These lemon flavor based incense sticks ensure less fume and relaxing fragrance which enchants one and all. Our lemon flavored incense sticks are available in long sizes that assure consistent burning for hours. And the tinge of lingering effect of its fragrance creates extraordinary rise in its demand, especially aromatherapy centers, spas, and other "feel good" institutions. Our lemon incense sticks are available in attractive packs and at pocket-friendly prices.